Purpose built for reliable and economical operation, EtherRain™ is the most flexible dedicated networked sprinkler controller currently available. Designed for commercial and residential use, EtherRain networked sprinkler controllers, when combined with available software schedulers, provide efficient, accessible, low-maintenance, and water-saving networked control of landscape irrigation. EtherRain can be used on an Ethernet network, wired or wireless. EtherRain must be attached to the network through a switch, bridge, or router port. With the availability of an always-on connection (DSL, Cable, T1), EtherRain can be controlled/scheduled without need for a local always-on computer. EtherRain units can be stacked to control a virtually unlimited number of valves. EtherRain acts as an intelligent client to an irrigation scheduling server. It requires receipt of only one command to initiate irrigation. Once a command is received EtherRain manages the complete cycle with no further intervention. A scheduling server is required to deliver the command. This architecture results in many benefits compared to other designs including: highest reliability (reduced complexity; no loss of schedule on "gadget glitch"); less maintenance (no battery; no time drift; no schedule loss); better irrigation control (smart irrigation schedulers can provide more optimal irrigation timing). A wide array of scheduling servers are compatible with EtherRain including: LawnCheck; MiCasa Verde Vera; HomeSeer; MCS Sprinklers; OptiRain for Windows; OptiRain Open for Linux and Mac OSX. Each of these scheduling servers provide their own unique benefits. Some can be used in combination. See below for more information on scheduling servers. EtherRain was designed to be installed in a dry location. Network connectivity is facilitated by the ability to connect EtherRain to an existing network using Wireless/WiFi Bridge devices (link opens .pdf), Ethernet Powerline adapters, as well as traditional CAT5 network cable. Please see the application notes provided below for information on how to use Wireless bridging and Powerline adapters with EtherRain. 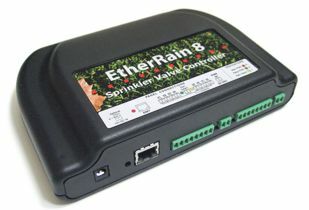 Because EtherRain uses an Ethernet port for connectivity it is easy to configure a WiFi sprinkler irrigation controller. Click here for more information. EtherRain is currently available via direct order and can be shipped to both US domestic and international locations. See below for purchasing information. EtherRain has been delighting our customers by reliably controlling their automated sprinkler systems since 2008. If your irrigation application includes a master valve or requires a pump control output the EtherRain 7P controller is required. If not, select EtherRain 8.